The previous two parts of this blog have considered general features for combo and list boxes, but there is one thing you can do with a listbox that you can't do with a combo box: allow a user to select lots of records at the same time. 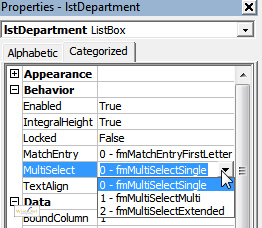 You can choose 3 possible values for a MultiSelect listbox. The difference between frmMultiSelectMulti and frmMultiSelectExtended (who thinks up these names?) is that with the latter you can click and drag to select lots of adjacent items at the same time. Here we have selected at least 3 departments (more may be shown selected if we scroll down). Notice here that the ListCount property gives the number of items in the list (numbered from 1), but the Selected array is numbered from 0.